She sells sea shells by the sea shore. With the prospect of seeing whales on the horizon we travel into the great state of Massachusetts where we will devote our time to visiting some amazing locations. 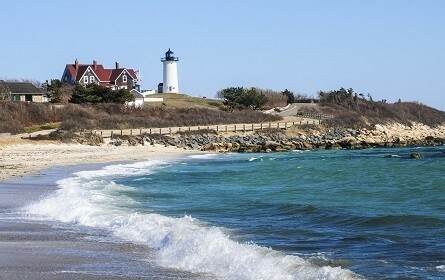 We will spend 4 nights in Hyannis while dedicating the days touring Sandwich, Martha's Vineyard, Provincetown, and Nantucket. We then commence the journey home with a tour of Boston, shopping in the Quincy Market and a special Fireplace Feast at the Salem Cross Inn before making our way back into Ontario. Don't forget to bring your camera as surely you will want pictures of the pristine sandy beaches, brightly painted gingerbread cottages, lighthouses, and of course, a shot of yourself having the vacation of a lifetime. We bet it looks good on you. Complete brochure available.